The first study that shows that overweight in late adolescence in men is a significant risk factor for developing severe liver disease later in life has been published in the Journal of Hepatology. Contributing to the strength of this research are the large group of men studied (close to 45,000), very long follow-up time (nearly 40 years), and the high percentage of individuals who remained in the study (1% loss to follow-up). The incidence of several liver diseases, especially non-alcoholic fatty liver disease (NAFLD), has increased globally over the last few decades. During the same time, overweight, defined as a BMI above 25, and obesity, defined as a BMI above 30, have increased in both Europe and the USA, as well as globally. It has been estimated that if current trends continue, there will be more than two billion overweight and over one billion obese individuals worldwide by 2030. Obesity in adults has been linked to an increased risk for liver-related death or hospitalization in individuals both with and without liver disease, as well as a higher risk for liver cell cancer. In addition, overweight and obesity are associated with a worse prognosis in several liver diseases, such as NAFLD, hepatitis B and C, and alcoholic liver disease. Dr. Hagström and colleagues examined records of close to 45,000 Swedish men who were conscripted for military service in their late teens between 1969 and 1970. Conscription was mandatory in Sweden at that time, and only 2% to 3% of men were exempted from conscription, mostly due to severe disabilities or disease. 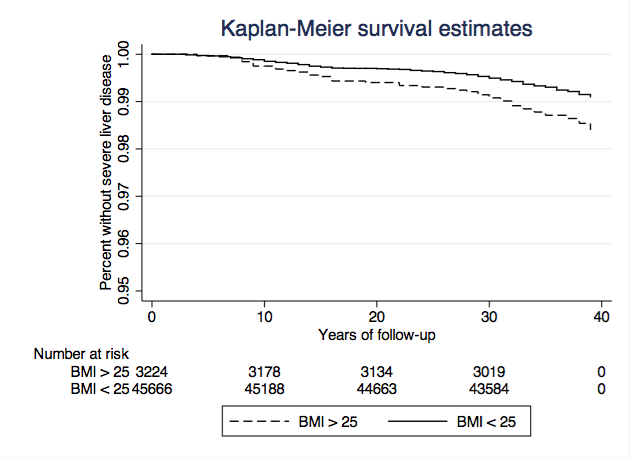 The purpose of the study was to assess if high BMI in late adolescence was associated with an increased risk of a severe liver disease, defined as a diagnosis of decompensated liver disease, cirrhosis, or liver related mortality later in life. The outcome data were collected from national registries to identify any diagnosis of severe liver disease up to the end of 2009. Kaplan-Meier curve for the development of severe liver disease, stratified on overweight status. After almost 40 years of follow-up, investigators found that 393 men had been diagnosed with severe liver disease and being overweight was a risk factor for developing severe liver disease after adjusting for a variety of confounding factors, including alcohol and tobacco. Nearly 3,000 (6.6%) men were overweight with a BMI equal to or greater than 25. Of these, 352 (0.8%) were obese with a BMI equal to or greater than 30. The results showed a 64% increased risk for overweight men compared to men of low normal weight, or a 5% increased risk per per 1 kg/m2 increase in BMI. Commenting on the study in an accompanying editorial, Vlad Ratziu, MD, PhD, of the Hôpital Pitié-Salpêtrière, Institute of Cardiometabolism and Nutrition, Assistance Publique-Hôpitaux de Paris, France, and Giulio Marchesini, MD, of the Unit of Metabolic Diseases and Clinical Dietetics, “Alma Mater” University, Bologna, Italy, emphasized that the deleterious impact of obesity on liver health should be taken seriously. But while this study does establish that the obesity-related risk for future severe liver disease exists early in life, the type and magnitude of this risk need further refinement. “Overweight in late adolescence predicts development of severe liver disease later in life: A 39 years follow-up study,” by Hannes Hagström, Per Stål, Rolf Hultcrantz, Tomas Hemmingsson, and Anna Andreasson (doi: 10.1016/j.jhep.2016.03.019). “Editorial: When the journey from obesity to cirrhosis takes an early start,” by Vlad Ratziu and Giulio Marchesini (doi: 10.1016/j.jhep.2016.05.021). Published online in the Journal of Hepatology, in advance of Volume 65, Issue 2 (August 2016), published by Elsevier. Full text of these articles is available to credentialed journalists upon request; contact Sybrand Boer Iwema at +31 20 485 2781 or hmsmedia@elsevier.com. Journalists wishing to interview the study authors should contact Hannes Hagström at hannes.hagstrom@ki.se. Vlad Ratziu may be reached for comment at vlad.ratziu@inserm.fr. For questions concerning the Journal of Hepatology, please contact Editor-in-Chief Rajiv Jalan at hmsmedia@elsevier.com. The Journal of Hepatology is the official journal of the European Association for the Study of the Liver (EASL). It publishes original papers, reviews, case reports and letters to the Editor concerned with clinical and basic research in the field of hepatology. The journal, with an Impact Factor of 11.336, is the top-ranking journal in Hepatology according to the 2014 Journal Citation Reports® published by Thomson Reuters, 2015. In the forty plus years since EASL was founded, it has grown from a small organization that played host to 70 participants at its first meeting, to becoming the leading liver association in Europe. EASL attracts the foremost hepatology experts as members and has an impressive track record in promoting research in liver disease, supporting wider education and promoting changes in European liver policy.